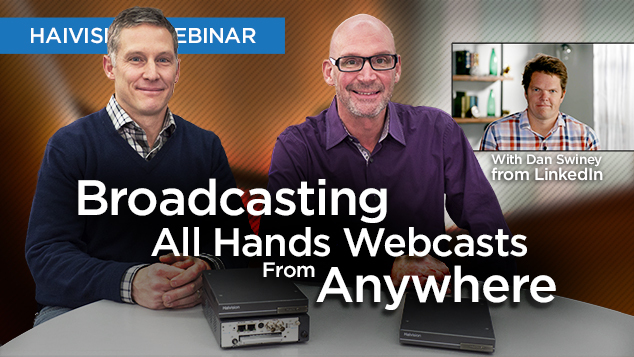 Learn how to manage when your presenters are offsite, and how to enable higher-quality, lower-latency video streams. In this webinar, video experts from Haivision and LinkedIn will show you how you can make strategic use of encoders with your existing enterprise video platform to solve the offsite contribution problem. What happens when your video presentation happens offsite? For companies who are not content to use low-quality video, or try to navigate the unreliable world of video conferencing tools, there are more reliable alternatives. Learn how LinkedIn, Twitter, SAP, BMW, and other companies are enabling remote contribution in their enterprise video workflows. See the problems facing enterprise video managers, and the pitfalls of using lower-quality video to communicate across locations. See how a lack of reliability, an overabundance of latency, and excessive expense leave video managers seeking out other solutions. Find out what’s missing from your enterprise video workflow, and learn three highly efficient corporate video workflows for remote contribution used by Twitter, BMW, and other businesses, and how you can configure them within your existing video platform. See how LinkedIn manages remote contribution, and how that’s affecting their company culture. You’ll see an example of offsite contribution using Haivision video streaming solutions in action!